Inasmuch as we are readers of the 21st century living through “digital” encounters with the public square, it’s useful to revisit the circus. Mencken would ask no less of us. His contrariness should be our own. His delight in ruddy, unprincipled American bedlam is the stuff of Ringling Brothers: in Mencken’s hands the essay is a parade that comes to town, a parade that makes you rub your eyes. As Mencken saw it, America offered the sort of clowning that would never tire a spectator. The Marx brothers were without sentiment down there in the bilge of capitalism. Flushed from their hiding places they ran amok on the big ship, each driven by hormones and appetites. Every authority figure was a fraud. And the funniest joke of all — they had to sneak into France. No one sneaks into France. Only the pure of heart would have trouble getting in. Only the pure of heart would pretend to be Maurice Chevalier. The jokes are all so elegant, and they were always stealing dinner rolls. “If you like that, read Mencken,” my father said. “I have been attending the permanent town meeting that goes on in Robinson's drug store, trying to find out what the town optimists have saved from the wreck. All I can find is a sort of mystical confidence that God will somehow come to the rescue to reward His old and faithful partisans as they deserve–that good will flow eventually out of what now seems to be heavily evil. More specifically, it is believed that settlers will be attracted to the town as to some refuge from the atheism of the great urban Sodoms and Gomorrah. America is the land of mirth: anti-intellectual, occult, credulous, and best of all, afraid of its own Puritanical boredom. But don’t worry. Mencken assures us there’s a parade for that. While the “Army of 50 Clowns” offers Mencken many targets for laughter, perhaps none is so often fixed to the point of his bayonet as Anthony Comstock. The founder of the New York Society for the Prevention of Vice, Comstock pushed successfully for state and federal laws that made it illegal to send obscene literature through the U.S. postal system. Designed to prevent women from acquiring information about contraception and abortion the laws were often used by civic authorities to prevent the publication of literature. Mencken wrote: "In Comstockery, if I do not err, the new Puritanism gave sign of its formal departure from the old, and moral endeavor suggested a general overhauling and tightening of the screws…." Inasmuch as this is a personal essay I should say that by the age of 20 I was well addicted to Mencken. I found ample opportunity to laugh alone in the college library. Outside that library where war protests were underway and where the rhetoric of moral improvement was continuous, I saw that the loudest student “do gooders” were invariably anti-intellectual—that they were bounders of a sort. I was grateful to Mencken for raising the possibility that they were a particularly American “sort”. There was an unintelligent craze going on. The children of Babbitt were having ideas. “The ideas that conquer the race most rapidly and arouse the wildest enthusiasm and are held most tenaciously are precisely the ideas that are most insane.” Who would put Abbe Hoffman in charge of anything? Yes, I saw that reading Mencken wouldn’t make you popular. I also saw that Mencken was no nihilist. A contrarian, he was also a humanist who celebrated the essay for its own benedictions and not as an engine of manifest desires. Art is “free independence” as Hegel put it. 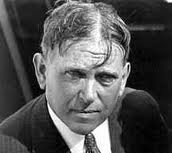 Certainly in Mencken’s view, the American essayist might not change the nation’s muddy parades but he should always (with sufficient courage) tell us where the clown armies are marching. All the while I have been forgetting the third of my reasons for remaining so faithful a citizen of the Federation, despite all the lascivious inducements from expatriates to follow them beyond the seas, and all the surly suggestions from patriots that I succumb. It is the reason which grows out of my mediaeval but unashamed taste for the bizarre and indelicate, my congenital weakness for comedy of the grosser varieties. The United States, to my eye, is incomparably the greatest show on earth. It is a show which avoids diligently all the kinds of clowning which tire me most quickly – for example, royal ceremonials, the tedious hocus-pocus of haut politique, the taking of politics seriously – and lays chief stress upon the kinds which delight me unceasingly – for example, the ribald combats of demagogues, the exquisitely ingenious operations of master rogues, the pursuit of witches and heretics, the desperate struggles of inferior men to claw their way into Heaven. We have clowns in constant practice among us who are as far above the clowns of any other great state as a Jack Dempsey is above a paralytic – and not a few dozen or score of them, but whole droves and herds. Human enterprises which, in all other Christian countries, are resigned despairingly to an incurable dullness – things that seem devoid of exhilirating amusement, by their very nature – are here lifted to such vast heights of buffoonery that contemplating them strains the midriff almost to breaking. I cite an example: the worship of God. Everywhere else on earth it is carried on in a solemn and dispiriting manner; in England, of course, the bishops are obscene, but the average man seldom gets a fair chance to laugh at them and enjoy them. Now come home. Here we not only have bishops who are enormously more obscene than even the most gifted of the English bishops; we have also a huge force of lesser specialists in ecclesiastical mountebankery – tin-horn Loyolas, Savonarolas and Xaviers of a hundred fantastic rites, each performing untiringly and each full of a grotesque and illimitable whimsicality. Every American town, however small, has one of its own: a holy clerk with so fine a talent for introducing the arts of jazz into the salvation of the damned that his performance takes on all the gaudiness of a four-ring circus, and the bald announcement that he will raid Hell on such and such a night is enough to empty all the town blind-pigs and bordellos and pack his sanctuary to the doors. And to aid him and inspire him there are travelling experts to whom he stands in the relation of a wart to the Matterhorn – stupendous masters of theological imbecility, contrivers of doctrines utterly preposterous, heirs to the Joseph Smith, Mother Eddy and John Alexander Dowie tradition – Bryan, Sunday, and their like. These are the eminences of the American Sacred College. I delight in them. Their proceedings make me a happier American. … Here politics is purged of all menace, all sinister quality, all genuine significance, and stuffed with such gorgeous humors, such inordinate farce that one comes to the end of a campaign with one's ribs loose, and ready for "King Lear," or a hanging, or a course of medical journals. But feeling better for the laugh. Ridi si sapis, said Martial. Mirth is necessary to wisdom, to comfort, above all to happiness. Well, here is the land of mirth, as Germany is the land of metaphysics and France is the land of fornication. Here the buffoonery never stops. What could be more delightful than the endless struggle of the Puritan to make the joy of the minority unlawful and impossible? The effort is itself a greater joy to one standing on the side-lines than any or all of the carnal joys it combats. Always, when I contemplate an uplifter at his hopeless business, I recall a scene in an old- time burlesque show, witnessed for hire in my days as a dramatic critic. A chorus girl executed a fall upon the stage, and Rudolph Krausemeyer, the Swiss comdeian, rushed to her aid. As he stooped painfully to succor her, Irving Rabinovitz, the Zionist comedian, fetched him a fearful clout across the cofferdam with a slap-stick. So the uplifter, the soul-saver, the Americanizer, striving to make the Republic fit for Y.M.C.A. secretaries. He is the eternal American, ever moved by the best of intentions, ever running a la Krausemeyer to the rescue of virtue, and ever getting his pantaloons fanned by the Devil. I am naturally sinful, and such spectacles caress me. If the slap-stick were a sash-weight, the show would be cruel, and I'd probably complain to the Polizei. As it is, I know that the uplifter is not really hurt, but simply shocked. The blow, in fact, does him good, for it helps get him into Heaven, as exegetes prove from Matthew v, 11: Hereux serez-vous, lorsqu'on vous outragera, qu'on vous persecutera, and so on. As for me, it makes me a more contented man, and hence a better citizen. One man prefers the Republic because it pays better wages than Bulgaria. Another because it has laws to keep him sober and his daughter chaste. Another because the Woolworth Building is higher than the cathedral at Chartres. Another because, living here, he can read the New York Evening Journal. Another because there is a warrant out for him somewhere else. Me, I like it because it amuses me to my taste. I never get tired of the show. It is worth every cent it costs. That cost, it seems to me is very moderate. Taxes in the United States are not actually high. I figure, for example, that my private share of the expense of maintaining the Hon. Mr. Harding in the White House this year will work out to less than 80 cents. Try to think of better sport for the money: in New York it has been estimated that it costs $8 to get comfortably tight, and $17.50, on an average, to pinch a girl's arm. The United States Senate will cost me perhaps $11 for the year, but against that expense set the subscription price of the Congressional Record, about $15, which, as a journalist, I receive for nothing. For $4 less than nothing I am thus entertained as Solomon never was by his hooch dancers. Col. George Brinton McClellan Harvey costs me but 25 cents a year; I get Nicholas Murray Butler free. Finally, there is young Teddy Roosevelt, the naval expert. Teddy costs me, as I work it out, about 11 cents a year, or less than a cent a month. More, he entertains me doubly for the money, first as a naval expert, and secondly as a walking attentat upon democracy, a devastating proof that there is nothing, after all, in that superstition. We Americans subscribe to the doctrine of human equality – and the Rooseveltii reduce it to an absurdity as brilliantly as the sons of Veit Bach. Where is your equal opportunity now? Here in this Eden of clowns, with the highest rewards of clowning theoretically open to every poor boy – here in the very citadel of democracy we found and cherish a clown dynasty! Isn’t Michelle Bachman a wonder? Good gosh, she’s even managed to distract me from my wide-eyed incredulous fascination with the activities of Sarah Palin! Her comment about the HPV vaccine made me mindful of the descent of that (rather large) group of Americans who live their lives by the anecdotal hearsay passed on in social networking venues. Mencken’s lucky he can laugh at it — it gives me the heebie jeebies. LB, you are right, I re-posted Mencken. The ludicrous, serio-comedic narratives of the Tea Partiers puts me in mind of The Master! It’s useful to recall America has always been a pan-opticon of gibberish spouting toxic clowns. Hey, this posting is deja vu all over again, and the comment even looks vaguely familiar. But it’s got me thinking about Baltimore. Mencken, Zappa, John Waters…What exactly goes on in Baltimore anyway? Thanks for that — embarrassed to say that until I read the above H.L. Mencken was no more than a name that I recognized. Where has he been all my life?